There are many different tests online to help you pinpoint your personality type, also known as temperament. Some have as many as sixteen different types. This kind of depth and complexity can be useful for understanding a lot about ourselves. It also infers there are only 16 types of people. It is also somewhat limiting as it doesn’t allow for change or growth within our basic personality. I’ve used a basic 4 type personality model for years because it gives us general understanding of who we are, but allows for infinite variation within our type and the possibility for movement, or growth. Picture a large plus sign +. The vertical axis is our basic energy level, or “pace” as Charles Boyd calls it in his book Different Children Different Needs. At the bottom are the extremely laid back, casual people, at the top are folks who are driven to move all the time. The horizontal axis represents a continuum of people-focused on the left to task orientated on the right. These two lines form a grid with 4 quadrants. 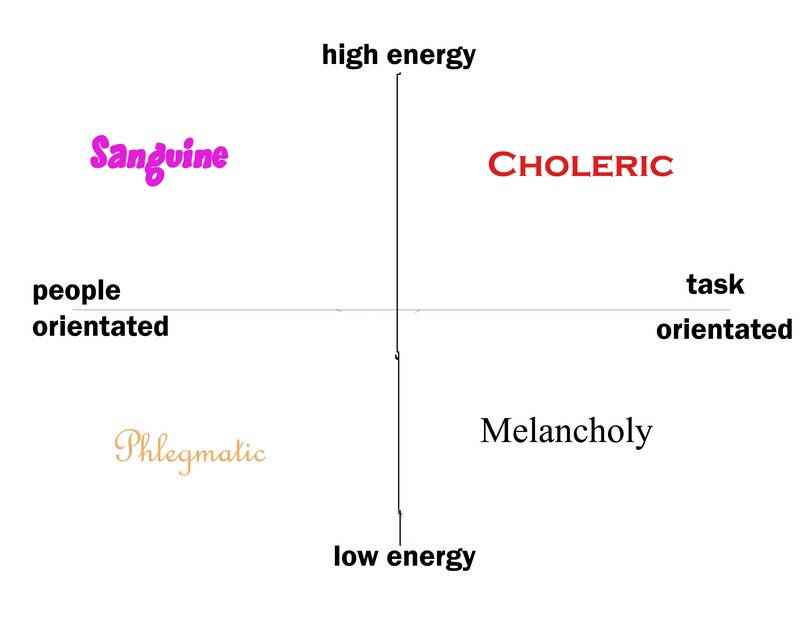 The upper left quadrant is our Sanguines, top right are Cholerics, bottom right are the Melancholy types, and bottom left is for Phlegmatics. Cholerics share the high side of the energy level with Sanguines but focus their efforts on achieving things. Cholerics are the goal setters, the get-it-done-no-matter-if-it-kills-me people. If Sanguines are the cheerleaders in life, Cholerics are the coaches. They work well alone, but they know exactly what everyone else needs to do and they’re not afraid to tell them so. Where the Sanguines organize parties, Cholerics organize projects. Pooh’s friend Rabbit is 100% Choleric. More details about Rabbit are found here. All teams need a manager and a Melancholy is perfect for the job. Found on the lower right side of our grid, Melancholies are great at attending to details. They’ll keep the stats, organize the locker room, solve the logistics and rarely get distracted from their task. Melancholies think everything through carefully. They spend so much time thinking and analyzing, all of life seems like serious work to them. Fun is a foreign concept. Of all the folks in the Hundred Acre Woods, Eeyore is the full Melancholy type and his in-depth description is here. Sharing this tendency for quiet introspection are the Phlegmatics at the lower left of our model. Here are our team players. Flexible, easy going and agreeable, Phlegmatics have the unique ability to operate in any of the other three quadrants, even stretching to the opposite corner to lead like a Choleric if the need arises. They will rarely start an argument and are the first to mediate other’s conflicts. With their slower pace, Phlegmatics can be counted on to be calm in almost any situation; sometimes to the point of inertia. With his charming personality and gentle manner, Pooh Bear is a great example of a Phlegmatic and you can read all about Pooh at this link. If you were to plot their places on the grid, Pooh and his friends would sit at the extreme outer corners of their respective quadrants. People are not so easily or obviously pegged. You might identify with Tigger’s cheerleader like friendliness, but prefer Pooh’s slower pace, putting you closer to the border between Sanguine and Phlegmatic. Both Melancholies and Phlegmatics love to help people, Melancholies by devising systems to better people’s lives, Phlegmatics by listening and serving. If you like to help people but from a distance, you might be a blend of Phlegmatic and Melancholy. Full Cholerics can be tactless and bossy, but a Choleric blended with Melancholy tendencies softens that dictatorial stance. Hopefully, our objective is to move toward the center of the grid. Still unique in our own way but overcoming our weaknesses and growing in our understanding of others. Take this quick and easy personality type test to help pinpoint your child’s personality type or even your own!